After a 6-0 undefeated season in league play, the ORSU Women advanced to the USA Rugby Elite 8 Nationals in Austin, TX. In their first match, the Jesters faced a large and strong Chicago North Shore team, with quick, skilled backs. In a fierce battle, both teams kept each other out of their try zones until well into the second half. ORSU held a slight edge in possession and territory during the first half, but couldn't break the goal line. North Shore slotted two penalties in the first half, while ORSU missed their attempts. Following a yellow card to ORSU and an ensuing penalty conversion about 10 minutes into the second half, North Shore was finally able to breach the Jesters' goal line. ORSU's opponents capitalized well on the yellow to score another uncoverted try, with the final score North Shore 21-0 ORSU. However, on Sunday ORSU came out firing against the Seattle Breakers and never let up the lead. Both the forwards and backs put in a spirited performance with some great phases of rugby, to defeat the Seattle Breakers 38-22. Nationals are always challenging, and we are proud of our Jesters for their efforts! ORSU Jester Women's Captain San Juanita Moreno was a key part of the undefeated Pacific Coast Grizzly 7s team that won the 2011 Women's National All Star Championship (NASC). The Grizzlies took on the USA Developmental team in the final, beating the USA 34-17. Congrats, SanJay! Read more about the tournament at RugbyMag. As a fundraiser for the new clubhouse project at Fuller's Farm, the ORSU Jesters hosted a golf tournament and dinner on July 30, 2011at Stone Creek Golf Club in Oregon City. Attended by a wide variety of Jesters and supporters spanning the decades, this event was a fantastic time. What's more, we exceeded our expectations for our very first Farm Fund event, with proceeds totaling more than $17,000! This total includes a contribution from the Lindsay Babb Memorial Fund and from a generous donation from the Babb family. Thank you to all who attended, donated, and sponsored - we can't wait to see you next year! ORSU's fifth annual Roy Lucas 7's tourney was held on on June 25, 2011 - what would have been Roy's 68th birthday. With picture-perfect sunny weather, twelve men's teams and four women's teams put on a great show of competitive, fun rugby. 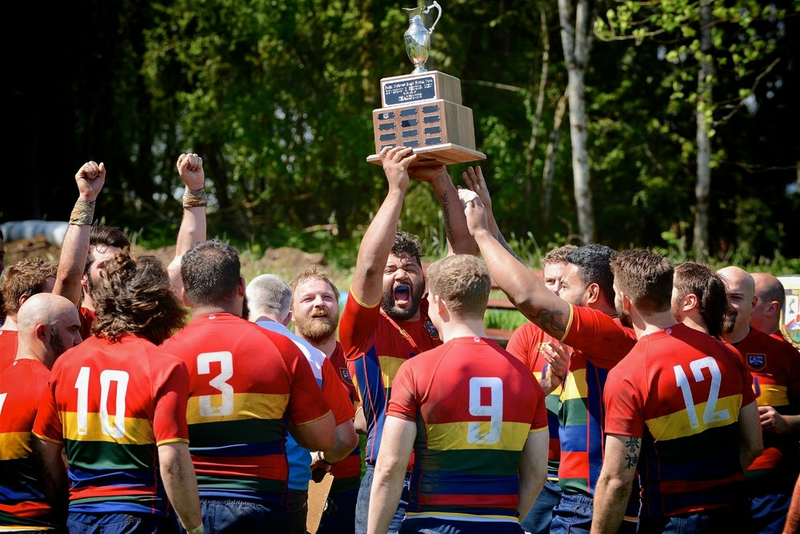 Old Puget Sound Beach put on an impressive display in winning the cup, while the Eastside Axemen won the plate competition for 5th place. Eugene was dominant in the bowl competition, while the ORSU women took first in the women's bracket. Read the full results on the 7s page or on RugbyMag! The ORSU men celebrated the 2010-2011 season with a banquet at Paddy's. The Jesters capped off a winning season filled with good rugby that saw D2 finish third in PNRFU and reach the Pacific Coast playoffs, while D3 battled this season but posted a couple of landmark wins. Thanks to Paddy's and Bridgeport Brewery for their excellent sponsorship throughout the season! Thank also to David Lind, for match videography and putting together this awesome video of some memorable moments from the season. A special thank you to our families, fans, and Old Jesters who continue to support ORSU and the incomparable sport of rugby. We couldn't do it without you all! The ORSU D2 men finished the season ranked third in PNRFU, with a league record of 8-3-1. This season showcased a competitive division, particularly in the Portland metro area, as the top two teams finished with just one more league win. ORSU moved on to PNRFU playoffs on Saturday, coming up short against the Pigs in a match that was marked by injuries to both teams and was ultimately called early. However, ORSU rallied back to defeat Chuckanut on Sunday, winning the third PNRFU seed to the PCRFU playoffs. Because of structural quirks in the PCRFU playoffs, ORSU will travel to San Francisco and face the Pigs again on Saturday, May 7. The winner will move on to the second day of tournament play, competing for seeds at the national Sweet Sixteen. GO ORSU!!! The ORSU and Reed College women's rugby teams supported the good works of local community nonprofits with a Red Dress Rugby Benefit Match on Saturday, April 16, 2011. The match was an entertaining display of spirited rugby, with both sides scoring 5 tries each but the White Dresses edging the Red Dresses 33-25 on conversion kicks. Most importantly, we raised $600 to donate to the Red Dress grant fund benefiting local charities YWCA of Clark County, the Cascade AIDS Project's Pivot program, and The Q Center. Thank you to everyone who helped make Red Dress Rugby a success and a fantastic time! Kudos to the fans who turned out to support the event, and special thanks all of our players and sponsors!Visit the Red Dress Rugby page for a list of sponsors and awards. ORSU Played host to the Pacific Coast Women's Grizzlies all-star team on Sunday, April 17, 2011. The Grizzlies fell to the Southern California Griffins by a score of 19-27 (over 3 thirty-minute periods). The Griffins came out strong in the first 30, going up 15-0. The Grizzlies battled back but were unable to overcome the deficit. Women's captain Beckett Royce was awarded an ORSU Lifetime Achievement Award for her outstanding accomplishments in club, territorial, and international play. Royce has 14 international caps, most recently making her mark for the USA Eagles at the 2010 World Cup. Her contributions to ORSU include 6 years as a player and more than 4 years of captaincy, as well as coaching, fundraising, and organizational efforts. Royce has received the Young Player of the Year award her first season with ORSU, as well as MVP and the Tackle Sword multiple times. Thank you Beckett, and congratulations for all you have achieved! The ORSU D2 men's team finished the Fall 2010 half of its season undefeated in league play. The Jesters notched a record of five wins and one tie, also winning Valley's friendly pre-season Pat Ryan Invitational Tournament. ORSU looks ahead to another full slate of matches leading to playoffs in the spring. Boosted by outstanding performances by ORSU captain Beckett Royce, the USA defeated Kazakhstan, Ireland, and Canada to finish 5th in the World Cup. Jester teammate Ashley Kmiecik also contributed to the USA's World Cup effort, putting her body on the line in a try-scoring performance in the USA's win versus Kazakhstan. We are so proud of our Jester Eagle World Cup warriors!!! ORSU's annual Roy Lucas Invitational 7's tournament was a smashing success, with 12 men's sides and 8 women's sides participating to make it our biggest sevens tournament ever! Congratulations to the Emerald City Mudhens, who swept the women's division, winning both the cup and plate. In the men's division, congratulations to the Pigs for winning the cup, ORSU for winning the plate, and Eugene for winning the bowl. Well done everyone, and we hope to see you back next year! The ORSU men's teams celebrated their 2009-2010 season with a banquet on Saturday, May 15, 2009 at Paddy's. The Jesters toasted a winning season that saw both teams reach the playoffs. The D2 side finished second in the PNRFU South Division while the D3 side finished second in PNRFU D3, both ranking the highest among Oregon teams. The ORSU D3 men have finished the 2009-2010 regular season ranked second in PNRFU D3, with a record of 9-5. They head to the Kitsap County Fairgrounds in Bremerton, WA for playoffs the weekend of April 24-25. ORSU will play third-ranked Corvallis on Saturday the 24th at 3:15 pm. On Sunday the 25th, depending on results, they will play at 3:15 or 1:30, versus Budd Bay or the Pigs. For more information on this event, visit http://kitsaprugby.org/tourney/PNRFU_2010_DIII_Tourney/Home.html. The ORSU D2 men have finished the 2009-2010 regular season ranked second in the PNRFU South Division, with a record of 8-6. This puts ORSU fifth overall in PNRFU for the season, and the highest-ranked team in the Portland metro area. ORSU will be rehabbing the pitch at the Farm this spring. Our field for home matches the rest of the spring 2010 season will be Glenhaven Park in NE Portland. The ORSU Womens' team thanks our supporters for making our Bowling Night fundraiser a success! Special thanks to Nike, Williams-Sonoma, Powell's Books, Amazon.com, Buffalo Exchange, Bishops Barbershop, and Starbucks for their prize donations. Beckett Royce, San Juanita Elguezabal-Moreno, and Ashley Kmiecik have been named to the USA pool of 35 players for the Women's Rugby World Cup in England this fall. The USA team will assemble for two skills camps, two test matches versus Canada at the annual CanAm competition in June, and a three-week July residency program, before finally departing for England on August 8. Congratulations to these players, and we continue to support you in your hard work! The March 2010 issue of Portland Monthly features a profile of San Juanita Elguezabal-Moreno, who recently competed for the USA in the International Invitational Sevens Tournament in Las Vegas. Thanks to Portland Monthly for the positive coverage of women's rugby! Foward Beckett Royce and back Ashley Kmiecik will represent ORSU on the US Women's National Team as the Eagles take on Canada in a two-match Atlantic Cup series on January 12 and 16, 2010. We are proud of you - go Eagles! Local Portland weekly newspaperWillamette Weekfeatured a profile of the ORSU women's program in the 11/11/09 issue. The article can be found in the current issues in newsstands, or viewed onlinehere. Thanks to theWillamette Weekfor its coverage of rugby! The ORSU Women's annual Jester Round Robin Tournament at Fuller's Farm was once again a great success. This year's round robin grew to eight teams, including U of Oregon, Oregon State, U of Idaho, U of Washington, Boise Women, Bend Women, Oregon U-19 All-Stars, and ORSU's D1 team. Congratulations to all the participants, who showcased the continued growth of women's rugby with spirited, exciting matches. ORSU women's team captainBeckett Roycewas part of the USA women's squad that came second (to England) in theNations Cupin Toronto. The US lost to England, tied France, and defeated South Africa and Canada. Congratulations, Beckett and the rest of the Eagles! ORSU commemorated the club's35th anniversarya celebration the weekend of June 27, 2009.The celebration featured an Old Boys vs. Current Players match, showcasing some of the great talent ORSU has fostered throughout the years, and the match ended in a tie. In fitting Jester fashion, a pig roast, bonfire, and social followed the rugby action. It was wonderful to see so many Jester friends, old and new. Beckett Royce, San Juanita Elguezabal, and Ramey Marshall will represent ORSU on the US Eagles and USA A teams to take on Canada the week of June 22 - 27 in Glendale, CO. Congratulations to our hard-working players, and GO EAGLES!! Led by ORSU coach Jarred Power, the Pacific Coast Grizzlies took the 2009 National All-Star Championship title, defeating the Northeast 36-5. Several ORSU players featured on the squad, including a standout performance from flanker Beckett Royce, who scored two tries in the final. We're proud of you, Grizzlies! ORSU hosted the annualRoy Lucas Sevens Tournamenton Saturday, June 6, 2009atFuller's Farm. With 10 teams entered in the tournament, ORSU went undefeated in its pool matches to face the Tsunami in the final, just like last year. The Tsunami were able to take the win and secure their second consectutive championship - Tufu from the Tsunami was named the tournament MVP. On May 14th, ORSU'smen's sevens teamwas again featured atPGE Parkat halftime of a Portland Timbers game. ORSU defeated the U of Oregon Ducks 5 tries to 3, in a 10-minute sevens match. With a great response from the Timbers crowd, the rugby fans in attendance, and the players themselves, this event is sure to be repeated. Thank you to Concept Entertainment, PGE Park, and the Timbers for the opportunity! The ORSU men celebrated their2008-2009 seasonwith a banquet on Saturday, May 16, 2009 at the Thirsty Lion. The Jesters toasted a season that saw the D2 side continue as a strong force, while also adding a successful D3 side to the club to offer greater participation for more players. The ORSU Women's team has accepted a spot in the newly formed USA Rugby Women’s Premier League (WPL) to start in Fall 2009. THE WPL will be comprised of eight of the top senior women’s clubs, formerly of Division 1. The initial eight clubs were selected by ranking the overall finish order from the last three National Championships and by each club’s interest in participating in the WPL.These teams include: ORSU, Berkeley, New York, Beantown, Minnesota, Twin Cities, Keystone, and Washington, DC. This opportunity will allow ORSU players to develop their skills in competition at the nation's highest level. In addition, entry into the Premier League means that ORSU's former B Side will now face local Division 1 competition, increasing playing time and development opportunities for all players. Keep an eye out for this exciting competition, coming to The Farm this fall. Continued efforts have paid off for flanker Beckett Royce and center San Juanita Moreno, who have again been named to the Women Eagles, and for scrumhalf Ramey Marshall who was newly selected for the USA 'A' developmental squad. The three players recently attended the Women's National Team combined camp, from Feb 26 - March 1at the National Training Center in Clermont, Florida. Congratulations to ORSU's Eagles! Congratulations to ORSU's Women Eagles! A big congratulations to ORSU women's players Beckett Royce and San Juanita Moreno, who were selected for the US National Team's Nations Cup Tour of England. We are proud of you - go Eagles! After a terrific reception in June, the ORSU Men's Sevens team returned to PGE Park in downtown Portland for a sevens rugby exhibition match versus Oregon State University on July 24, 2008. The match was the halftime feature for the Portland Timbers versus Carolina RailHawks soccer game, played in front of a crowd of 8,200. ORSU defeated OSU 3 tries to none. ORSU's annual Roy Lucas Sevens Tournament, held on June 7, 2008 at Fuller's Farm, was once again a great success. In a field of eight Pacific NW sides, the home team came away with second, while the Tsunami (Portland Eastside) emerged as 2008 champions. It was a fun day for spectators as well, full of exciting play and close competition. Participants included ORSU, Tsunami, Missoula, Budd Bay, Bend, Pigs, OSU, and Eugene. Congratulations to the Tsunami, and cheers to all of the teams who competed this year. The ORSU men's team wrapped up the 2007-2008 season with prizegiving at the Thirsty Lion on Saturday, April 26th, 2008. The event included not only dinner, drinks, and some of the best mustaches around, but also the unveiling of ORSU's new jersey and trophy display, and a dazzling magic show by Grey Lerner. Team photographer Mark Murray screened a slideshow of the season. The ORSU women's team was featured on the show "Ritmo Deportivo" on the Telemundo network on Sunday, February 24th, 2008. The show, which highlights "extreme" sports throughout the US and Mexico, included a light-hearted segment featuring the ORSU women's team explaining and demonstrating various aspects of rugby to the show's hostess. The Grizzly Shield was held at Fuller's Farm on November 17th and 18th, co-hosted by ORSU. The Loggers lost a tight match to the NorCal Pelicans, 3-5, on Saturday, while Arizona defeated Utah 10-0. NorCal went on the take the Shield, beating Arizona 41-5, while the Loggers rallied to defeat Utah 18-5. Grizzlies Assistant Coach Rod Sears said, "We were pleased with what we saw from the Pacific Northwest. From having no Loggers team in 2006 to not only fielding a team, but putting on the entire event - they did a tremendous job." Rugby Club for a great Grizzly Shield. Your effort and fine organization is greatly appreciated." Congratulations to the ORSU Women for their history-making performance at 2007 Nationals! ORSU traveled to Sanford Florida November 9-11 to compete in the national Elite Eight. ORSU defeated Philadelphia 41-24 on Friday, and lost narrowly to Keystone, 20-23, in the Plate Championship on Sunday. ORSU now assumes the rank of Sixth nationally. The ORSU Women's team would like to thank everyone who supported our Elite Eight Fundraising efforts. The spaghetti dinner was a huge success, and your donations are deeply appreciated. A big thanks to the ORSU men's team, Old Boys and Old Girls, and the Portland rugby community for making our trip possible!